"Argentina's future is in its blends," said Neal Martin, Robert Parker's Wine Advocate taster, after tasting more than 1,500 Argentine wines. And this wine is exactly the future he was referring to. 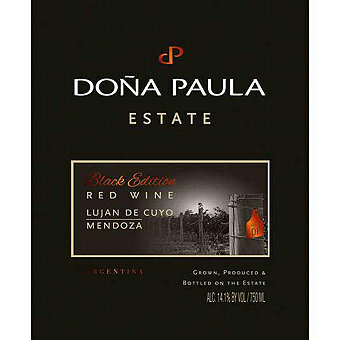 The Doña Paula Estate Black Edition Red Blend has an intense black purple color. On the nose, its aromas of plum, spices and pepper stand out while on the palate it is harmonious and balanced, with round tannins and a long finish. A blend of 60% Malbec, 35% Cabernet Sauvignon and 5% Petit Verdot aged in French oak barrels for 10 months. Wine Express customers couldn't get enough of premier vintage drinking up over 450 cases. The Beverage Testing Institute rates this "Highly Recommended" and says "Dark garnet color. Aromas of stewed tomatoes, charred beef, and fresh mint with a slightly chewy, crisp, full body and a warming, medium-length dried cassis, cola, and sweet tobacco finish with earthy tannins and moderate oak. A full bodied wine with a savory edge; food friendly." and James Suckling scored it 90 points saying "A fresh and leaner style with black currants and blueberries. Full-bodied, minerally and crisp. A blend of malbec, cabernet sauvignon and petit verdot."